“State of Social Media, Middle East: 2018” is the seventh annual study on social network use in the Middle East and North Africa (MENA) written by Professor Damian Radcliffe, and the first co-written with University of Oregon student Payton Bruni. A new 30-page white paper from Damian Radcliffe and Payton Bruni at the University of Oregon provide an up-to-date analysis of how people across the Middle East are using social media networks. Their research highlights the increasing prominence of visually led social media in the region – led by YouTube and Snapchat, as well as the ongoing popularity of Facebook’s different products; from the original network (Facebook) through to other Facebook-owned services like Instagram and WhatsApp. Alongside this, the authors show how concerns about Fake News and the rise of bots are emerging in the region, alongside questions about regulation, the limits of online expression and the role of social media influencers. Facebook has 164 million active monthly users in the Arab world. This is up from 56 million Facebook users in 2013. Egypt remains the biggest national market for Facebook in the region, with 24 million daily users and nearly 37 million monthly mobile users. 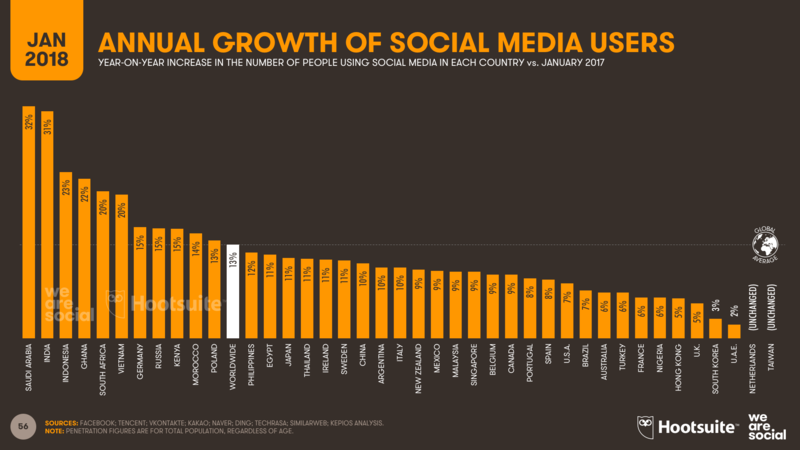 Saudi Arabia (KSA) has the highest annual growth rate of social media users anywhere in the world. Data from We Are Social and Hootsuite, revealed social media users in KSA grew by 32% vs. a worldwide average of 13% (Jan 2017-Jan 2018). Retweets mean the top 2% (0.6% overall) drive c.75% of the Twitter conversation, researchers Marc Owen Jones (Exeter University) and Alexei Abrahams (Princeton) found. There are about 12 million daily users of Snapchat in the GCC. This includes 9 million in Saudi Arabia (out of a population of 32 million) and 1 million in UAE. More than 200 YouTube channels in the region have over one million subscribers. Over 30,000 channels have more than 10,000 subscribers. Egypt’s new social media laws mean that social media accounts with more than 5,000 followers can be monitored, and websites must be licensed by the government. Almost two thirds (63%) of young Arab Youth say they look first to Facebook and Twitter for news; and nearly half of young Arabs (49%) say they get their news on Facebook daily, up from 35% last year. Huda Kattan, was ranked number one on CNN’s list of the Top 10 beauty influencers in the Middle East. Her net worth is estimated at $550 million. She has 32.1 million Instagram followers. An Instagram post from footballer Cristiano Ronaldo, who was in Dubai for New Year’s Eve 2018, has had nearly 10 million likes. Ronaldo has 153 million Instagram followers. “Notable trends from the past year include the continued popularity of Facebook and Facebook-owned products, especially with Arab Youth, as well as increasing challenges to online freedom of expression in many parts of the region. Saudi Arabia continues to be a social media powerhouse, being one of the biggest national markets for Snapchat and YouTube in the world. Meanwhile, the rise of social media influencers has met with some pushback; from regulation in UAE, to more tragic and threatening responses in Iraq. This report explores these developments, as well as emerging questions about the rise of fake news on social media, and the role that social networks are playing in Yemen’s civil war. Damian Radcliffe, is the Carolyn S. Chambers Professor in Journalism at the University of Oregon’s School of Journalism and Communication; a Fellow at the Tow Center for Digital Journalism at Columbia University, and an Honorary Research Fellow at Cardiff University’s School of Journalism, Media, and Culture Studies. He has been writing about the Middle East since 2012, and his work on the region has been quoted by a wide range of industry experts globally and across the Middle East. “Social media in the MENA region has followed similar trends from previous years, Facebook use continued to grow with millions of users, but there have been some significant developments in 2018. Notably, Egypt cracked down on social media with new laws that went into effect this year, placing restrictions on media accounts and blogs with over 5,000 followers. Social media in Yemen has also seen some big changes due to the war taking place in the country. Unsurprisingly, services such as Twitter were used by Yemenis caught in the conflict as a way to make their voices heard.